M anmade CO2 has already increased ocean acidity by 30%, a value that is projected to rise to 300% by 2100. Antarctic waters will be amongst the earliest and most severely affected regions by ocean acidification. In this study, we used minicosms to incubate natural communities of coastal Antarctic marine microbes under a range of CO2 concentrations. Over the course of the study we quantified changes in the structure and function of the microbial communities, through the use of fluorometry, flow cytometry, phytoplankton and bacterial productivity, microscopy and metagenomics. This project aims to understand the physiological responses that drive community shifts, discover thresholds of sensitivity, determine response curves for taxa and communities and shed light on the mechanisms leading to their vulnerability. 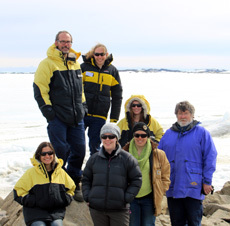 Antarctic Ocean Acidification team, Davis Antarctica, 2014.